This week’s episode of The Bachelor Canada left us feeling rosier than usual thanks to a visit to Oakville’s Elm Hill Cookies. Owner Janis Smith sought out Jump’s services in launching her artisan cookie business with a brand design that perfectly aligned with her ‘no corners cut’ cooking mantra. Our resulting work includes the design of Elm Hill’s logo, website and retail space. To breakdown the set-up for all the non-Bachelor devotees out there, late in the competition, ‘The Bachelor’ himself visits the hometowns of the remaining four ladies to see them in their ‘natural’ environments. One of the ladies, Gabrielle, just happens to be an Oakville native. What better way to win over the man of her reality television dreams than with some delicious Elm Hill Cookies? The twosome enjoyed some quality time inside the beautiful boutique-style store, enjoying a sampling of Janis’s amazing treats and giving all of Canada a delicious taste of the Elm Hill brand. While Gabrielle was eliminated at the end of the episode, it’s safe to say the decision had nothing to do with the cookies, (in fact they probably made it much harder.) But hey, at least she has Elm Hill Cookies around the corner to comfort her broken heart. We’ll save you a stool at the Milk & Cookies Bar! Enjoy this extra sweet episode, which re-airs Saturday. 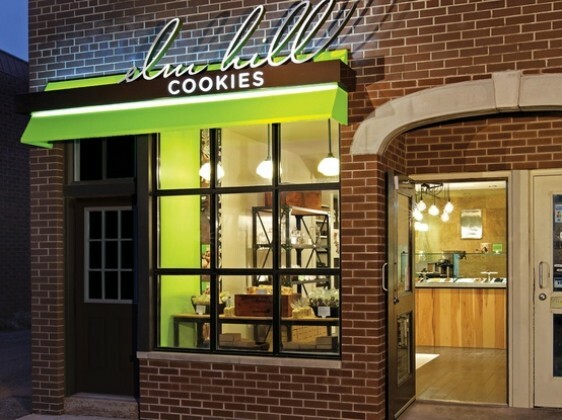 Next time you’re in Oakville check out Elm Hill Cookies for yourself. If you’re hungry for more of Jump’s environmental designs take a peek inside terra20, the one-stop eco store that’s also been getting plenty of attention on the airwaves lately.